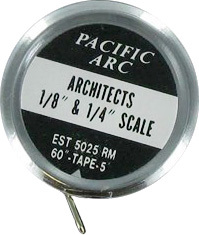 A Pocket Estimators Measuring Tape with 1/4 and 1/8 Architect Scales. The metal blade is five feet long. The Pocket Estimators Tape includes Manufacturers 30 Day Warranty. These are sold at a quantity of 2 or more.